1.) Choose a dark color scheme that represents the harvest, like burnt orange, oxblood red, or amber, paired with black. You could also go black-on-black, though I myself prefer a pop of color, even if it is just gold or silver for your utensils. 2.) Use a lacy black tablecloth for a bit of elegant drama - for added depth you can drape it over a solid black tablecloth or an orange/red solid tablecloth for extra pop. 3.) Keep tableware and place settings simple and elegant. You can use plate chargers in your desired color palette to add a bit of elegance (plus, they are fairly inexpensive at Target). For plates, simple black will do (IKEA has some inexpensive ones!) or you can re-use Halloween china you may have. 4.) Get some cloth napkins to match your tablecloth (or just use black). There are lots of options for what to do with napkins - you can fold them simply, or you use some velvet ribbon and tie it around the napkin. I also like tucking some fresh herbs or flowers that match your color scheme into the ribbon. You can also re-purpose Halloween rings (spiders, bats, skulls) and use them as napkin rings! 5.) For centerpieces, consider spray painting some small tree branches black and placing them on the table or in vases with pumpkin trees or a variety of autumn flowers or foliage. 7.) Re-use uncarved pumpkins you may have from Halloween as centerpieces - I love the little ones that work great on gothic tablescapes - you can even spray paint them black (or whatever color you like). 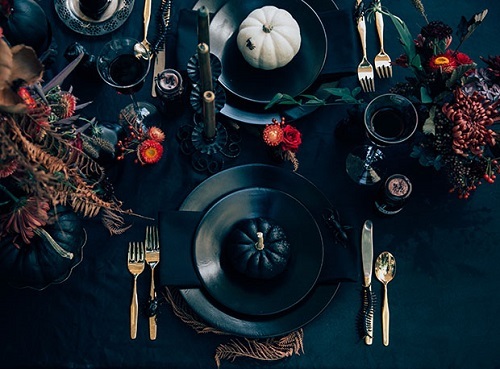 I hope these tips are a helpful start to creating a ghoulishly gothic tablescape for your Thanksgiving. Wow, This is the first time I've ever heard of a Gothic Thanksgiving! You have very creative ways of integrating the Gothic aesthetic year-round. The color palate you suggested is precisely my wardrobe color scheme, 80% Black with Wine, Taupe / Brown or Pumpkin Orange. Happy Thanksgiving!